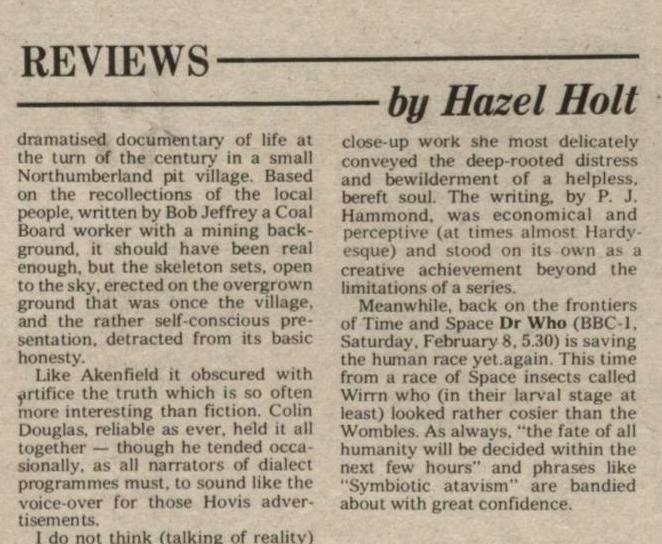 Meanwhile, back on the frontiers of Time and Space Dr Who (BBC-1, Saturday, February 8, 5.30) is saving the human race yet again. This time from a race of Space insects called Wirrn who (in their larval stage at least) looked rather cosier than the Wombles. As always, "the fate of all humanity will be decided within the next few hours" and phrases like "Symbiotic atavism" are bandied about with great confidence. APA 6th ed. : Holt, Hazel (1975-02-13). Meanwhile, back on the frontiers of Time and Space. The Stage and Television Today p. 17. MLA 7th ed. : Holt, Hazel. "Meanwhile, back on the frontiers of Time and Space." The Stage and Television Today [add city] 1975-02-13, 17. Print. Turabian: Holt, Hazel. "Meanwhile, back on the frontiers of Time and Space." 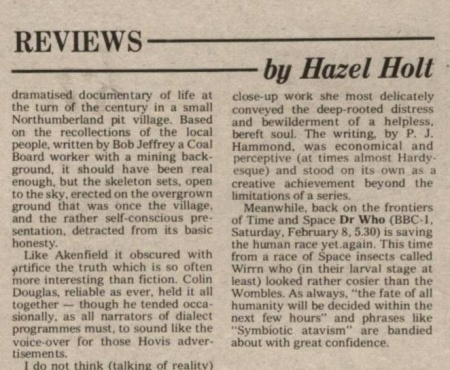 The Stage and Television Today, 1975-02-13, section, 17 edition. This page was last modified on 10 May 2014, at 12:03.